This is a side dish, made from onion and some natural herbs. This dish is prepared all over India in different ways using different ingredients. This is prepared, mainly, in southern part of India using fresh coconut and red chilly. I made this dish little bit easier to prepare for beginners and it comes out very tasty. I prepared it using green chilly and ground nuts. You will be happy to know that you need not spend much time for preparation and accuracy. You can serve onion chutney with idli, wada, dosa, pongal or any other rice item, even with Thalipeeth, Paratha, Chapati and Roti. I served this dish with fried rice, it was a very wonderful combination. Everybody loved it. This is a multipurpose chutney, you can try it once. We will how to prepare ts tasty and hot onion chutney. Remove one layer of onion and wash it with plane water. Wash coriander leaves, green chilly and curry leaves as well. 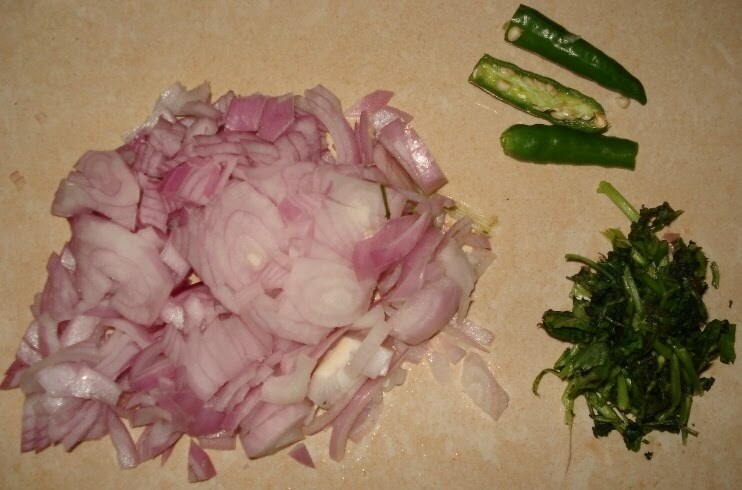 Chop coriander leaves and onion, separate curry leaves from its sprig and keep them in a plate separately. Wash and clean tamarind pulp and keep it in a bowl (without water). Clean the garlic clove and keep it separately. Heat a pan on medium flame, pour 1/2 tea spoon of oil to it. Add groundnuts and green chilly After 1 minute, roast them for 1-2 minutes and then add chopped onion and garlic cloves to it. Close the pan with lid and allow it to cook for 2-3 minutes. While adding green chilly, break the chilly into 1 or 2 pieces, so that they will not split wildly after adding them in oil. Open the lid, add tamarind pulp and mix it with the help of a spoon. Close the lid and remove from the heat and leave it to cool down for 10 minutes. Take a mixer jar, pour all cooked stuff to it. Add salt, chopped coriander leaves, curry leaves, grated dry coconut and a small quantity of water (around 50 ml) to it. Grind it to a fine paste. If you want, you can add some more water and grind it. Take out the chutney to a bowl. If you want you can use fresh coconut instead of dry coconut. I am using dry coconut so that chutney will not get spoiled early, and if we store it in refrigerator, it will stay for 2-3 days. Heat a small pan on medium flame, pour 1 table spoon oil to it. Add mustard seeds, wait until they splutter, now add udad dal (split black gram) and cumin seeds to it and stir it, remove it from heat immediately. When mustard seeds start spluttering means temperature of oil is very high, but udad dal and cumin seeds require very less heat to split. If you leave on heat after adding cumin seeds, the whole seasoning will be spoiled. Pour it on grounded chutney and mix it thoroughly so that chutney should absorb oil completely. Now your tasty and delecious onion chutney is ready to serve.